Positives: Won the Fielding Bible award at second base and was a Gold Glove finalist….nine homers was the highest amount he’d hit since 2015….had five three-hit games and a four-hit game against the White Sox on July 10….had a walkoff home run against the Cubs on May 5….eight of his home runs came against righties, leading to a .752 OPS….hit .362 with a .915 OPS during August….went 3-for-7 with two walks as a pinch-hitter….hit .319 batting seventh….hit .370 on the first pitch….hit .274 in high leverage situations….had a .361/.452/.556 line in the seventh inning….six of his home runs came off relief pitchers….hit .353 with a 1.009 OPS against the Cubs….hit .286 in night games….hit .317 in the second half, which probably can’t be completely pinned on the managerial change but it is really coincidental. Negatives: Dealt with injuries to his knee and hamstrings, limiting him to less than 400 at bats for the third straight year….had a .614 OPS against lefties….hit .213 in the first half, though seven of his home runs came then….hit .164 in May….posted a .454 OPS batting sixth….hit .229 ahead in the count and .219 behind in it….had a .607 OPS with runners in scoring position….it was a .545 OPS with two outs and RISP….hit .195 against starters the first time facing them in a game….hit .200 against power pitchers….had a .452 OPS against the Brewers….hit .180 in day games….my apologies to my Gateway cohost Tara Wellman for including this section. 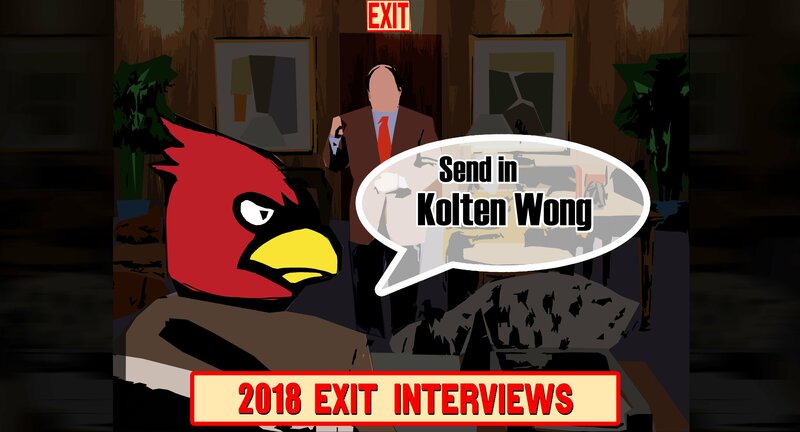 Overview: It’s still hard to know what the club has in Kolten Wong. We’ve seen him succeed in so many different facets of the game, but he’s not always put it all together. This might have been his best defensive year, as he put up some ridiculous plays and was able to take care of most of the routine ones as well, which has always been the mark against him. The second half of the season might be what Wong can be if everything comes together, when the offense is working and the defense is fine. Again, you don’t want to completely point to the change in managerial staff, but the relationship between Wong and Mike Matheny was fairly well documented. If there’s one thing that Mike Shildt can do, it is create confidence in a player and communicate well with them. Outlook: If the second half is what we can expect from Wong, 2019 could be a real breakout for him. Health is always going to be a factor, but even just a solid bat combined with his defensive capabilities and the Cards can have something special. It might complicate a few things in regards to upgrading the infield, but the club would be best served by sticking Wong at second and letting him go. It will be very interesting to see how he does under Shildt all year long and whether that will make as much of an impact as it seems.